A week is a long time in politics and it’s even more so the case in fashion, with feeds getting filled with newer content. must-buys and epic runway images by the nanosecond, however, this year’s GTB Fashion Weekend afforded itself more than a few memorable moments that have kept the fashion fam talking. Coming so close in the calendar after Lagos Fashion Week, comparisons are inevitable, but one can argue that the two events are an entire different offering. Yes, there are runway shows (more of later) but the centre pieces of GTB’s event are the Masterclasses, which have a veritable who’s who of Fashion Royalty come and share their experiences in the industry with a rapt audience, and a marketplace where fashion retailers can engage directly with potential customers and add to their bottom line. Masterclass high moment came from Nikki Ogunnaike Style Director of Elle.com who held the packed audience’s attention with her blend of relatable bon mots and fashion expertise. As an American of Nigerian descent it was perhaps easier for her to connect with the crowd, something that in previous years some masterclass speakers had struggled with, but her personality shone through when she spoke at length of the importance of authenticity. She also recognised the current mood in fashion when she stated: “There is a diversity of voices right now and that is so amazing. It’s revolutionised the industry.” Her statement was particularly powerful as it implied that the fight for everyone’s voice to be heard had to a greater extent been won, and that we can all allow ourselves a collective sigh of relief that the era of deducing cultures and alternative narratives to clichéd tropes was something lazy journalists could no longer get away with. Fingers crossed this remains the norm and is not a passing trend. 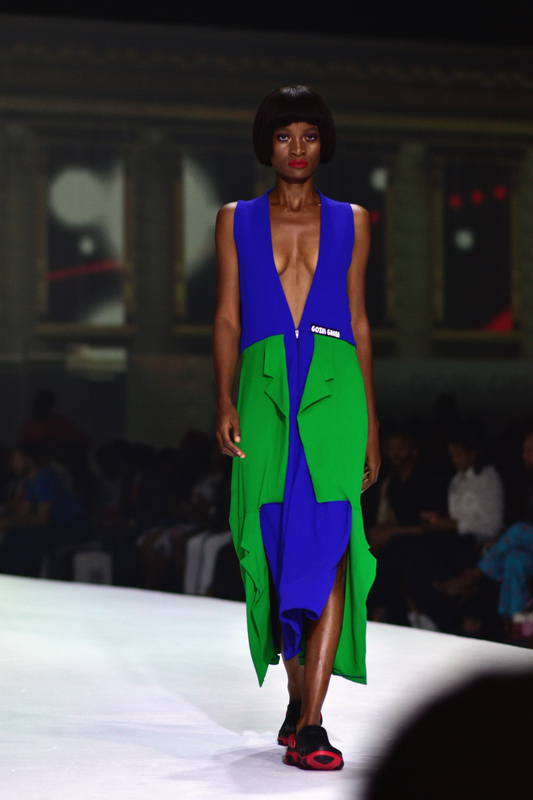 But onto the shows which were an intriguing mix of designers from Nigeria, South Africa, France and the United States. It was intriguing as the immediate assumption one would have is that the pieces shown on the night were either going to be stocked or easily available in Nigeria, which in the instance of the in the case of the Nigerian designers Ituen Basi and Gozel Green and Senegalese brand Sukeina was certainly the case, but less so with others. It returns to the question of the core purpose of the shows themselves which seemed more geared to entertaining and putting a spotlight on creatives rather than acting as a window for retail buyers to assess and potentially order collections. 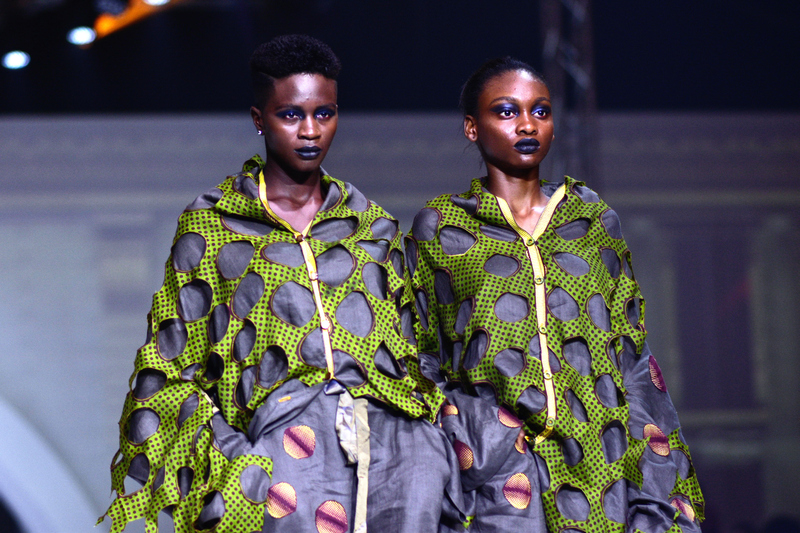 The energy was very much experiential, the shows’ core objective seemed to be for the audience to be immersed in the designers’ vision, to celebrate the best of black talent be it on the continent or in the wider diaspora and because this is Lagos, to see and be seen. With this as the remit one has a clearer framework with which to assess the shows themselves and in turn to manage expectations. 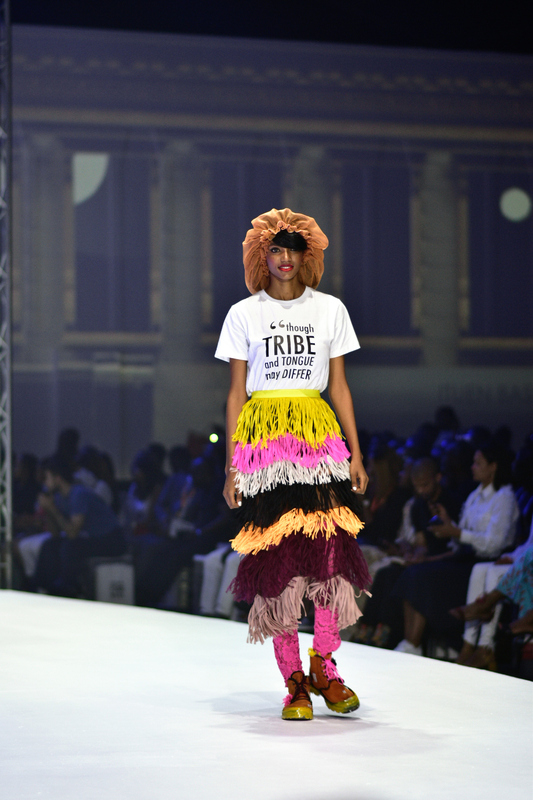 Opening was Ituen Basi a veteran of the Nigerian fashion scene who chose to make a collection that celebrated the country and its history using the 1970’s and the music of Fela Kuti as its lens, complete with a soundtrack of his greatest hits. 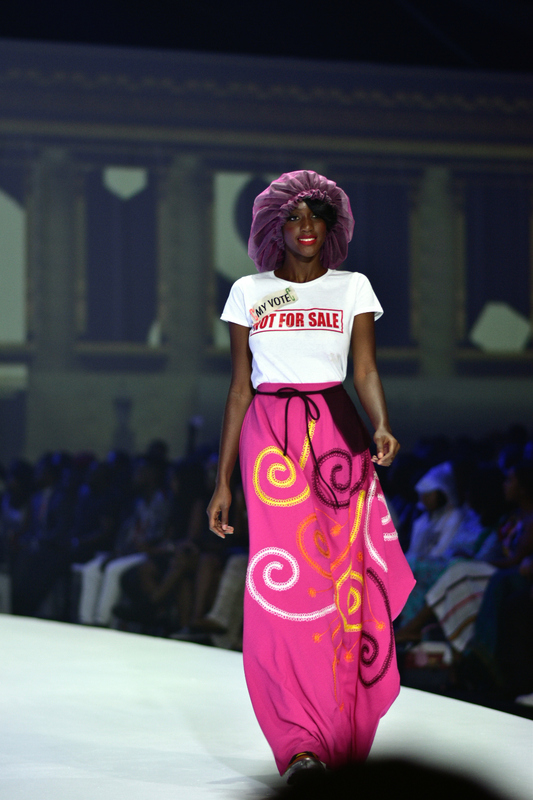 It certainly made for a cheerful and involuntary foot tapping show: models walked the runway with broad matte red lip smiles, T-shirts were adorned with slang phrases such as “Scatter, Scatter’ or more ones political messages that spoke to tribal unity and voter bribes. and lace body suits were given a dose of 21st century zing courtesy of their neon pink and acid yellow hues, strip fringing, some thing of a signature for Basi also featured. Aubergine and fuchsia pink were presented as the new neutral, contrasting strongly against the brights. Whilst this was not Basi’s strongest showing there was enough there to keep devotees happy. Collection of the night belonged to Sukeina who presented a collection that was entitled ‘Gates – A Tale Of Devine Femininity” and in short was a visual celebration of what it is to be a woman. I will admit that I am always biased when a designer dares to stick their head above the parapet and present a cohesive vision for how he sees women presenting themselves in any given season and Creative Director Omar Salam more than rose to the occasion. His signature body con with mesh and crochet and beaded panelled dresses were present and correct but added to the mix were shorter pieces that swapped pencil silhouettes for sassy fringed skirts that ended mid thigh. Black was the dominant colour but there was also a red sequence and black pieces that were accented with turquoise, yellow, and in some iterations lime which evoked the colour ways seen in Maasai beaded jewellery. 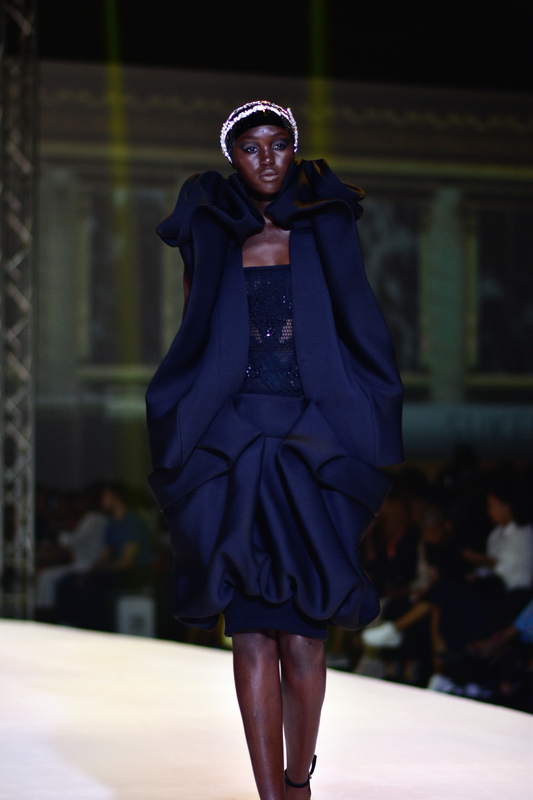 The shut down ensembles came via the pieces that had sculptural and origami style folds. A white coat dress was reminiscent of a flower in bloom and a black dress that comprised of beaded mesh and sculptured silk also impressed. The energy in the room distinctly changed and the rapturous applause merely confirmed what was evident on the runway. Romeo Hunte’s collection was the definitive shout-out on the runway to all of the lovers of streetwear who began to scream loudly the moment the bass dropped on his runway playlist. A heavy focus on outwear but with scant else teamed with it, especially with womenswear, meant we all received and understood the memo fully – clothes that only those with swag for days need attempt to wear. 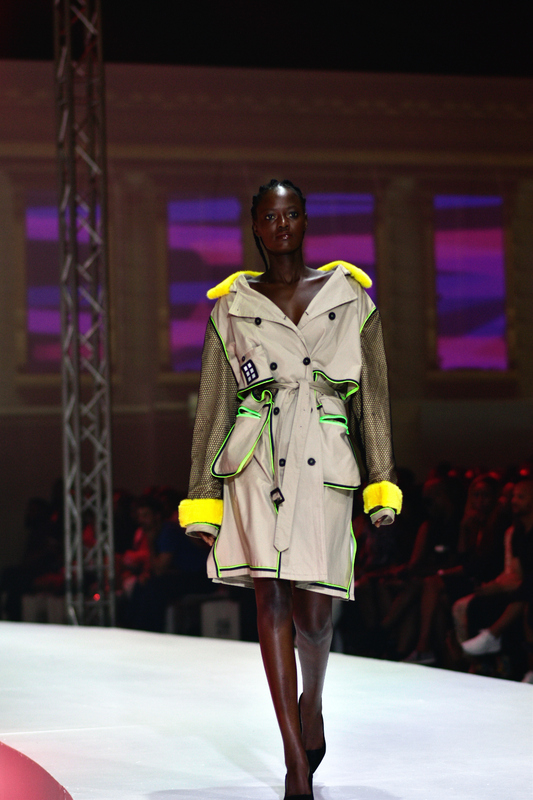 This is not to say that the looks were repetitive: from deconstructed parkas to off the shoulder puffer jackets, to bombers in army camouflage print with exposed shoulders and a Macintosh coat dress with neon piping, he ensured that outerwear was on lock. Some might counter, how can you wear this in the tropics of Lagos, but if you keep everything else to a bare minimum and blast the proverbial AC on full, your look won’t falter. Both Gozel Green and Adama Paris had shown at Lagos Fashion Week but it wasn’t a straight reiteration for those of us who had attended both. In the instance of Gozel Green the collection was larger and one could now see clearly how it was a tribute to the two creative directors’ late father, Professor Ossie Onuora Enekwe, whose love of formal attire is translated into pieces that celebrate menswear motifs such as suit lapels and classic shirts but retained the play on proportion and fluidity of fabric that have become the brand’s trademarks. For Adama Paris, it felt like the sequel to their prior offering which had seen pieces only in black, but in this instance we were presented a meditation of white, with chiffon, cotton and tulle all making an appearance. Clive Rundle is a South African institution who by virtue of longevity should be applauded. One could certainly tell that he knew the anatomy of what made a show: he had models seated before commencing their walks for instance, adding theatre to his presentation. However, the collection consisted of a collision of ideas, shapes, themes and palettes that never seemed to come fully together. Whilst one can remain a relevant and important voice whatever one’s age – observe the continued reign of Kaiser Karl Lagerfeld at Chanel, it’s a thin line between being a legend and appearing dated. 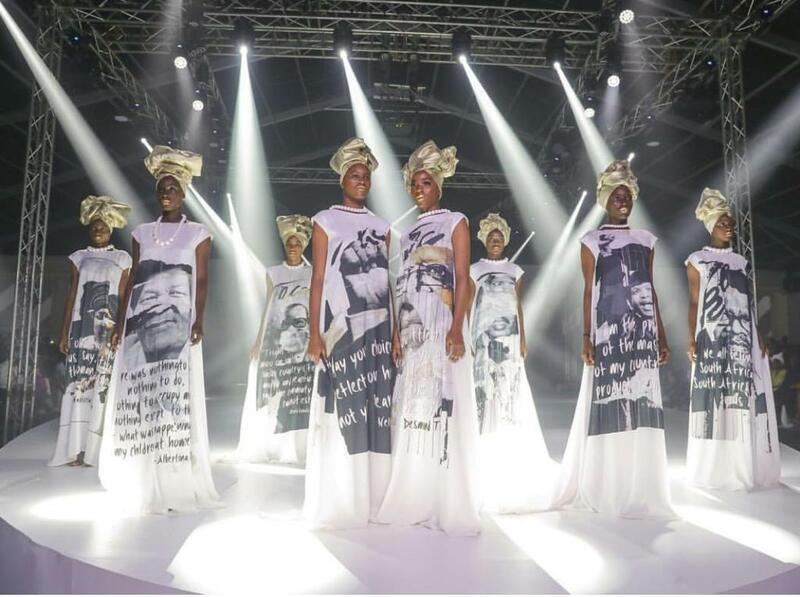 Closing the night and also providing the evening with a political bent was South African designer David Tlale who presented a series of maxi dresses with giants of Both Africa’s political past’s faces printed and with an accompanying quote. Customers could pick from Nelson Mandela, Desmond Tutu and Winnie Mandela or be more alternative and rock a piece with Steve Biko, Walter Sisulu or Oliver Tambo instead. It felt as if the designer was challenging all to acknowledge that twenty four years after the end of Apartheid rule was symbolised by Mandela’s election to the presidency, the realities of black inclusion and equality remain very much on the surface. From this bold start Tlale presented a collection that didn’t stand still with a wide array of silhouettes, palettes, and a typical metallic evening wear sequence. The clothes that followed felt somewhat discordant after such a strong opening, as if the collection had been done in conjunction with the marketing department who were concerned with appealing to as wide a customer base as possible, rather than allowing Tlale to create a clear narrative for customers to identify with, which the t-shirt dresses so tantalisingly hinted at. It was a pity as in our saturated and choice ridden world it is stories that resonate rather than shapes or motifs that prompt us to buy into a brand long-term. 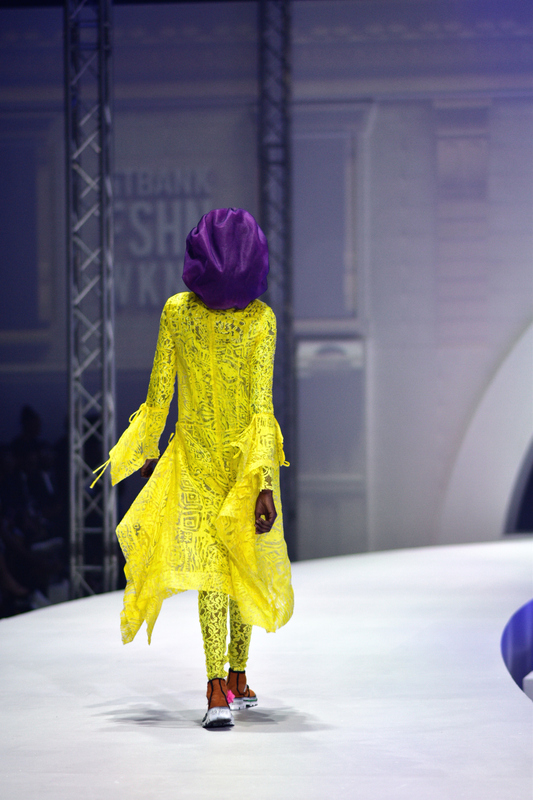 As the evening closed it was clear that fashion is a cultural driving force to be reckoned with in Nigeria. The packed venue, the cheers, the subsequent trending hashtags all attest to the insatiable appetite for clothes, beauty and conveying that you are living your best life via your sartorial and lifestyle choices. In fact, if commitment and interest were the only barometers by which an industry’s importance was measured, then fashion would have long trounced oil and gas in this part of the world. 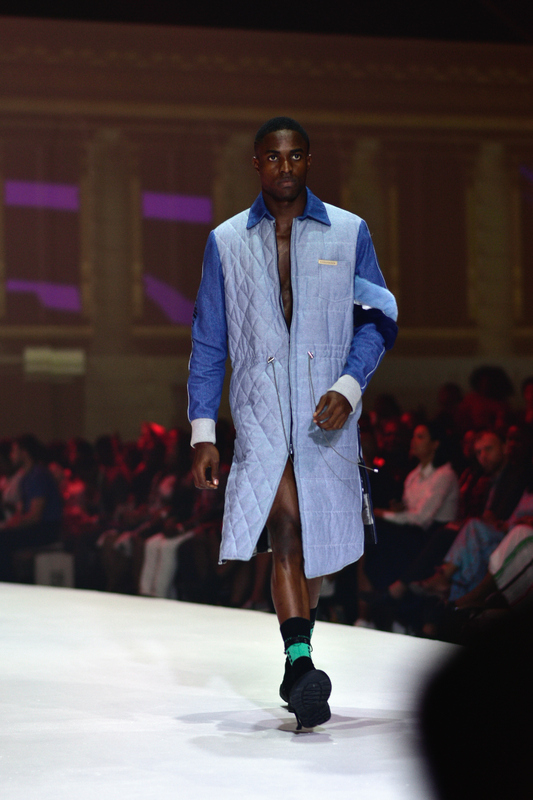 But for the runway segment to work on its own there needs to be a more deliberate curation of who is actually on it. Thankfully, everything ran to schedule with a barely noticeable ten minute delay, but one was still left wanting more: maybe it was the scene that was set by such a strong masterclass roster, or perhaps the slick production and staging whetted the appetite for a true visual spectacular, but Sukeina asides it was a quiet night for African fashion.